2nd generation TPU chips for faster A.I. training and inference. They will be available on Google Cloud Platform soon. Will AI come to play a role in courts? 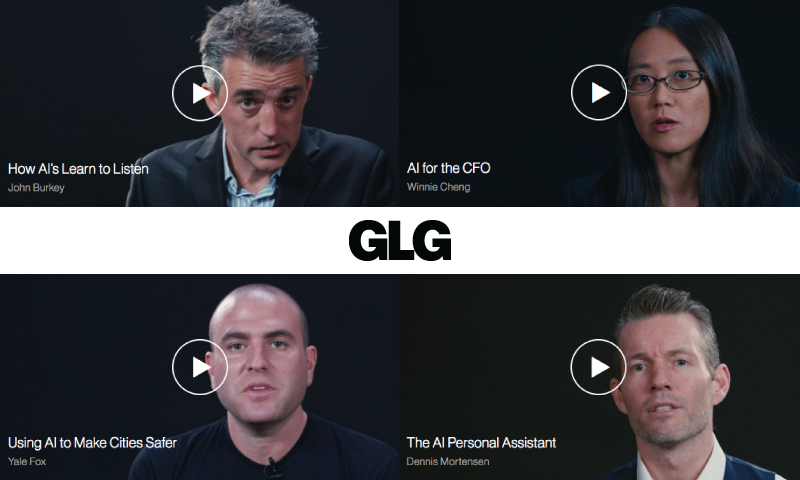 GLG is transforming the way the world’s top professionals learn. Watch our video series on AI's capacity to disrupt business featuring innovators from companies like Brightenai, Clarifai, and x.ai. Do you have AI expertise? Join our membership of 500,000 professionals for free and start earning for what you know. Open AI has trained a robotics system, trained entirely in simulation and deployed on a physical robot, which can learn a new task after seeing it done once. Twitter provides interesting details on its deep learning-powered ranking algorithm used to create users' timelines. Facebook published research results using a novel convolutional neural network approach for language translation that achieves state-of-the-art accuracy at nine times the speed of recurrent neural systems. Source code and trained systems are available on Github. SyntaxNet is an open-source neural network framework implemented in TensorFlow that provides a foundation for Natural Language Understanding (NLU) systems. "Deformable Convolutions are a drop-in tool for neural networks to let you sample from a large and more disparate set of points over an image, potentially helping with more complex classification tasks. " While recent advancements in Deep Learning have been fueled by GPUs, there is speculation that application-specific circuits (ASICs) such as Google's TPU might overshadow GPUs in the future. NVIDIA has announced they are working on their own TPU and will open-source the resulting technology. Perceived images are hard to decode from fMRI scans. But a new kind of neural network approach now makes it easier and more accurate. Presentation by Frank Chen (partner at a16z) on the way companies are using A.I. today and what is just a few years away from productization in research labs.